Tim Schadeberg, Community Bank President of the La Crosse Region, hosted the June 27 press conference in front of the new branch. La Crosse County and City leaders, together with the developer of Belle Square complex, gathered with Associated Bank regional management this afternoon to mark the opening of the bank’s new branch and regional headquarters – the first Belle Square tenant to open its doors for business. 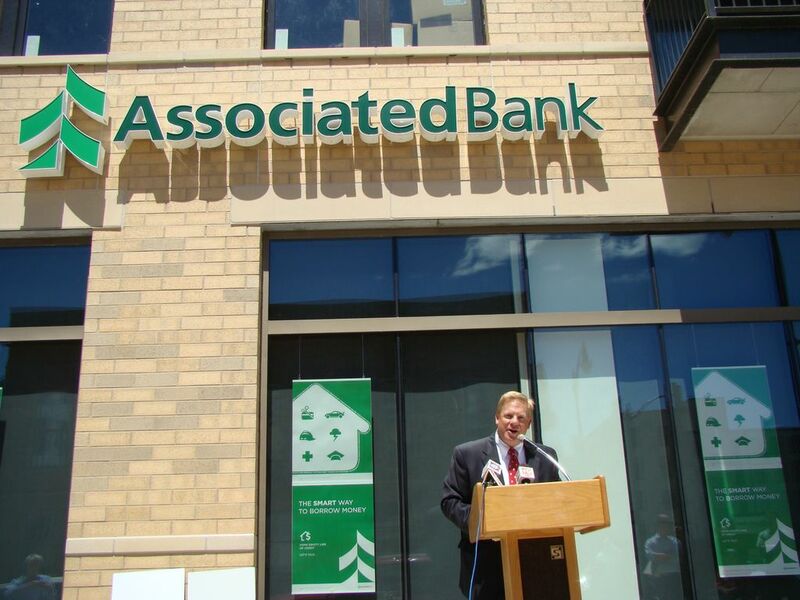 At a press conference in front of the branch, Tim Schadeberg, Community Bank President for the La Crosse Region of Associated Bank, reminded the attendees of Belle Square’s origin as parking Lot C.
“Some of us are old enough to remember the famous Joni Mitchell lyric – ‘They paved paradise and put up a parking lot.’ Well, this community has turned the tables on that stanza. It has taken a parking lot and turned it into a paradise of sorts for economic development; one that will benefit both the public and private sectors and make La Crosse an even better place to live,” Schadeberg said. Also making comments were La Crosse County Board Chair Tara Johnson and Don Weber, president of Weber Holding and Founder and Chairman of Logistics Health, Inc.
“We also appreciate the opportunity the repurposing of the former bank building is providing La Crosse County for its new Administrative Center,” Johnson said. Associated commemorated the event by making $5,000 contributions to both the Greater La Crosse Boys & Girls Clubs and La Crosse Promise. Mike Desmond and Jerilyn Dinsmoor, executive directors of the organizations respectively, accepted the donations. Associated’s new branch at 205 4th Street N is housed in 2300 square feet of the first floor. The full-service teller lobby features expanded banking capabilities and Associated’s unique, contemporary floor plan and design. The 10 branch colleagues have technology at hand to help customers learn the additional conveniences available through Associated’s online banking channels. The company’s regional management team, together with executives from other Associated business lines, are located in 6200 square feet of the second floor. The diverse team enables customers with one-stop shopping for all of their financial services needs. In addition to its new downtown branch, Associated has an in-store branch at Festival Foods, a Bridgeview drive-up location, two operations in Onalaska, and additional branches in Holmen and Viroqua.